During the World Wars, finding creative ways to “do without” or to use “essentials” in lieu of preferred ingredients was a way of life. Potatoes were abundant as was oatmeal. As a result, many of the recipes during that time of history make use of these types of essentials in recipes that we normally wouldn’t expect. Potatoes and oatmeal were also used in an effort to “bulk up” their recipes to be more satisfying and to squeeze in more calories and vitamins. Recently I’ve been playing with different pastry crust recipes and thought that I would share some of the options that I’ve enjoyed that come from that era. A lot of the pastry recipes from that time period call for “self-raising flour”—yep, that’s raising, not rising. You can easily create your own “self-raising flour” by combining 1 cup of white, all-purpose flour with 1 teaspoon of baking powder and 1/4 teaspoon of salt OR you can use the lower protein option of cake flour. I only use the aluminum free baking powder such as the Trader Joe’s brand. In the interest of packing in calories or nutrients, I always opt for RealSalt or Pink Himalayan Salt that doesn’t have the minerals stripped from it. Many of these WWII era pastry recipes called for potatoes and suet. Suet? Yep suet. If you’re like me you’ve only heard of suet as it’s used in bird feed, but it’s simply the fat that’s found in the cow near the kidneys. It’s very, very mild in flavor. As an alternative you can use the fat of the pig that’s also near the kidneys in the pig, which is also mild in flavor. In Europe you can still find suet easily and it’s also available in a dried form. But if suet hasn’t already made its way to your pantry or a butcher near you, don’t fret. You can easily use the regular shortening that’s widely available. In my everyday living I’m not a big fan of using shortening as I prefer to use real butter or coconut oil, but I also realize that in tough times these items may easily run out and I can keep shortening good on the shelf for a lot longer than I can butter and for a lot less money than I can obtain coconut oil. So for now, I live “high on the hog” with butter and coconut oil in my everyday pastry recipes, but at least I know that I can “make do” by familiarizing myself with these alternative, more frugal recipes. I have to say though that I have found these recipes to be more than just convenient and cheap as they add a different texture and taste to my savory crusts. While I do use butter to make my pie crusts typically, understand that the recipes below have much different ratios than traditional pie crusts of today. As such, I wouldn’t suggest that you use butter instead for these particular recipes, because it will brown very differently than suet. One of my alternative crust strategies is to use bacon fat when I’m making a savory pastry as well as my vegetable or fruit water for the binding water the recipes call for. 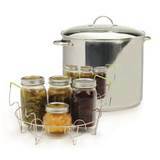 As the veggie or fruit water collects in the ½ gallon jars I use it, but if it gets to the point where I’m collecting more of it than I can possibly use in my cooking I boil it for a few minutes and then can it via the water bath canning method. I figure the jars were just going to sit there empty in the first place, so I might as well preserve cooking water in them, right? Back to the pastry recipes…these pastry crust alternative recipes were intended to be convenient and cheap and to be viable from the very basic essentials that housewives could get their hands on during the strict food rationing times of the World Wars. When it comes to taste, I won’t say that I love these alternatives better than my traditional pie crust recipes, but they definitely add a foundation to traditional savory and sweet dishes that one wouldn’t expect, and thus makes them a little fun to use and memorable. Most importantly though, they give you options! I’m all about the options…lots and lots of options. You may be aware of the highly favored “potato bread.” The addition of the potato or potato water is known to make this bread lighter and tastier. Well, the same happens when you use a potato in your pastry recipe. Roll out on a lightly floured board and use as you would any standard single pie crust. Roll out on a lightly floured board. And use as you would any standard single pie crust. In a medium bowl sift the flour and salt together and then add the rolled oats and fat. Mix well with your hands until all ingredients are evenly disbursed. Add a little bit of cool water in 1 T. increments until your pastry dough is bound together properly. These recipes sound great and I plan to try them soon. Very cool! Thanks for listing these! What is the difference between Suet and Lard? I have been storing Lard and haven't ever seen Suet offered in this area. Thanks! Suet is, as noted, the fat from around the kidneys. In the UK this is sold in packets, ready chopped, (about the size of a piece of fine grain), but in days gone by it would have been finely chopped as needed by the cook. Lard is rendered down fat. Either are used for pastry, but suet is also used for dumplings and savoury puddings that would have traditionally been steamed in a cloth. In these modern times, one can even buy a vegetarian version of suet, which is just as good in cooking. I can't imagine a winter without dumplings in my casseroles and stews. Lard isn't from that singular part of the animal, whereas the suet is--specifically around the kidneys. Lard, at its core, is nothing more than animal fat, but it's more traditionally viewed as being pork fat. Be careful in purchasing lard in the stores...it's usually not lard, but a franken-food made with the nasty canola oil. Kellene, You stated that you water bath any extra veg. or fruit water. I would think you would have to pressure cook it to keep it for any length of time as it is mostly not acidic. Also I can butter in my pressure canner, which will stay for a long time on the shelf. My granddaughter says she likes it much better than butter from the fridge. Taste great. I haven't tried baking crust with it yet but I will now. While water bathing isn't the most common practice today, it used to be the ONLY practice employed for decades and decades. So long as it's brought to a 180 degrees for about 5 minutes and put in clean, sterile jars, it's fine. It's technically referred to as the "kettle method." They used to even do meat this way. If i am not mistaken this time and temperature is for sea level. Make sure you adjust them for your altitude. I've discovered that when it comes to baking, you'll have MUCH better results if you weight the ingredients instead of measure them in a traditional manner. However, that being said there are lots of conversion charts available online. Be sure you differentiate between liquids and dry goods though when converting. In Australia too flour has always been sold as self raising as in England. Just another difference . Why do Americans call preserving 'Canning' when you use screw top jars? and Older Australian's call it bottling and we use jars with metal lids,seals and spring clips. things change with time. I cannot understand why americans spell the word 'solder' but pronounce it sodder (thats in electronics). Wouldn't it be a boring world if we were all the same . Love my first viewing of your website. Kellene, I've made an informal "home project" of WWII cooking, recipes, and how the ladies coped at home. You are spot on about these recipes. Marguerite Patten (from the Ministry of Food in WWII Britain) did publish many crust recipes of this type. If you have seen "The 1940s House" you have seen the ladies coping with making such crusts. Great knowledge to have just in case.....Thanks for posting! Probably a dumb question, but you are using ounces for measurements. I don't have a postal scale handy, so this translates into what amounts ???? in cups?